After months of planning, on Saturday, December 29, 1821, the first edition of ARKANSAS GAZETTE to be published in Little Rock came off the press. Due to a shortage of paper supplies, it was only a two page edition, instead of the four pages which publisher William Woodruff had been customarily printing. Because the capitol of the Arkansas Territory had moved from Arkansas Post to Little Rock earlier in 1821, Woodruff wanted to relocate as well. Not only did it make sense for a newspaperman to be close to the seat of government for purposes of stories, there was a financial reason for the move, too. Woodruff wanted to continue to be the contracted official publisher of government records. If he stayed in Arkansas Post, someone else would certainly have opened up an operation in Little Rock to do the printing. The first Little Rock edition featured the usual mix of national news (often culled from other newspapers once they arrived at Woodruff’s establishment), local stories, and advertisements. One of the stories was a letter from General Andrew Jackson to the citizens of the Florida Territory. There was also a dispatch from Pernambuco, Brazil. Because it was the first issue from Little Rock, Woodruff took time to write about Little Rock. He noted it was located on the south side of the Arkansas River on a “beautiful gravelly bluff” with picturesque views of the river and surrounding areas. He noted the territorial and federal government offices which were located in Little Rock. Though the Gazette ceased publication in 1991, the 1821 publication of that paper in Little Rock set the stage for more than just that one newspaper. It marks a continual presence of newspaper and journal publication in Little Rock for 197 years. The Arkansas Historic Preservation Program’s next “Sandwiching in History” tour will visit Curran Hall at 615 East Capitol Avenue, in Little Rock at noon today, (December 7). urran Hall is a great example of Greek Revival architecture and is one of few antebellum houses that survive in Little Rock. Construction began in late 1842. Mary Woodruff Bell (daughter of the Arkansas Gazette founder William E. Woodruff) purchased Curran Hall in 1884 and it remained in the Bell family until the last descendant, Avrill Tate moved out in 1993. The City of Little Rock and the Little Rock Advertising and Promotion Commission purchased the property and with the assistance of the Little Rock Visitor Information Center Foundation restored the property and converted it into the Little Rock Visitor Information Center. It was opened on May 18, 2002. Today the facility is run by the Quapaw Quarter Association, which also maintains its offices there. The “Sandwiching in History” tour series focuses on Pulaski County structures and sites. The noontime series includes a brief lecture and tour of the subject property. Participants are encouraged to bring their lunches with them. The American Institute of Architects offers one HSW continuing education learning unit credit for members who attend a “Sandwiching in History” tour. The tour is free and open to the public. For information, call the AHPP at (501) 324-9880, write the agency at 323 Center St., Suite 1500, Little Rock, AR 72201, send an e-mail message to info@arkansaspreservation.org, or visitwww.arkansaspreservation.org. The AHPP is the Department of Arkansas Heritage agency responsible for identifying, evaluating, registering and preserving the state’s cultural resources. Other agencies are the Arkansas Arts Council, Arkansas State Archives, the Delta Cultural Center in Helena, the Old State House Museum, the Mosaic Templars Cultural Center, the Arkansas Natural Heritage Commission and the Historic Arkansas Museum. On November 23, 1808, future Mayor Charles P. Bertrand was born in New York. He was the son of Pierre and Eliza Wilson Bertrand; his father died in 1809 in an uprising in Haiti and his mother eventually remarried. With her new husband, Dr. Matthew Cunningham, she and the family moved to Little Rock in 1820. After apprenticing with family friend William Woodruff at the Arkansas Gazette, Bertrand opened the Arkansas Advocate newspaper. He later studied law under Robert Crittenden and entered the legal profession. In 1835-1836, he served as State Treasurer for the Arkansas Territory, and in 1836 as secretary for the first constitutional convention. He was a member of the Arkansas House of Representatives from 1840-1841 and 1844-1849. Though a staunch Confederate, his good will toward the Union soldiers and federal officials is credited with helping to save Little Rock from the destruction which befell many other Southern cities. He is also credited with delaying the start of the Civil War. Prior to the attack on Fort Sumner, members of the Arkansas Militia were planning to attack the Federal Arsenal at Little Rock during the absence of Governor Rector. This would have been viewed as an act of war. Bertrand was able to dissuade them from the attack. Had he been unsuccessful, the Civil War would have likely started in Arkansas instead of South Carolina. He had put his considerable fortune into Confederate money during the war. At the Civil War’s conclusion, the family was financially ruined. Though they had vast land holdings, those would be sold off in parcels to pay for taxes. Bertrand died August 27, 1865, shortly after the conclusion of the Civil War. He, like his mother, step-father, and several other relatives, is buried in Mt. Holly Cemetery. 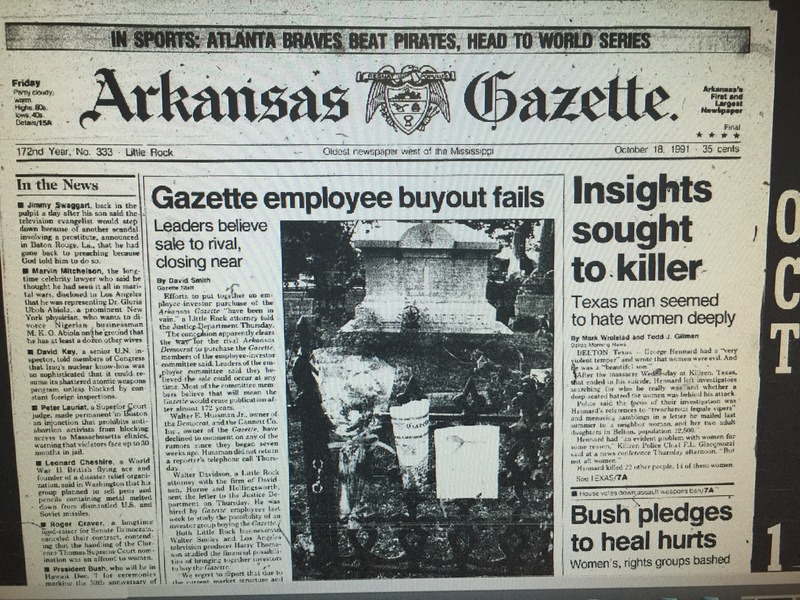 Twenty-seven years ago today, on October 18, 1991, the final edition of the Arkansas Gazette was delivered. 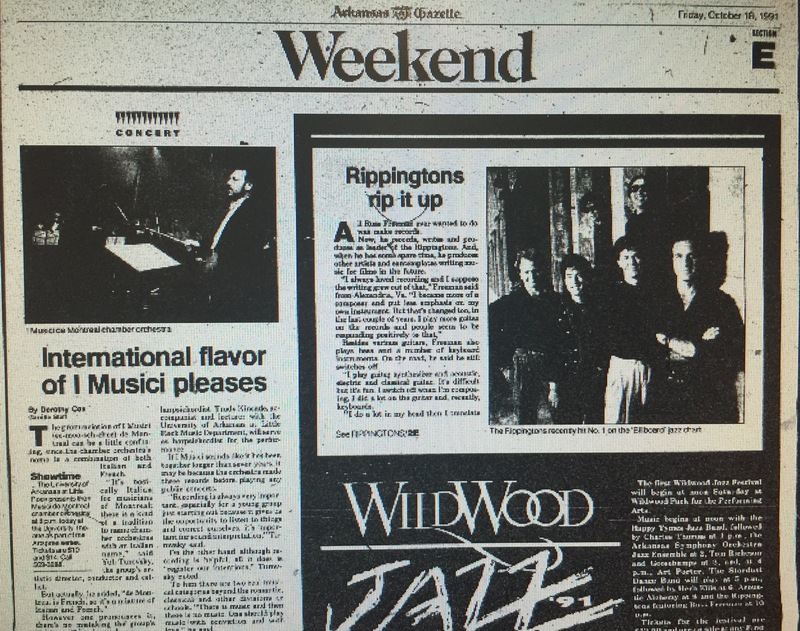 The front page featured a story on the demise of a Gazette employee effort to buy the paper. 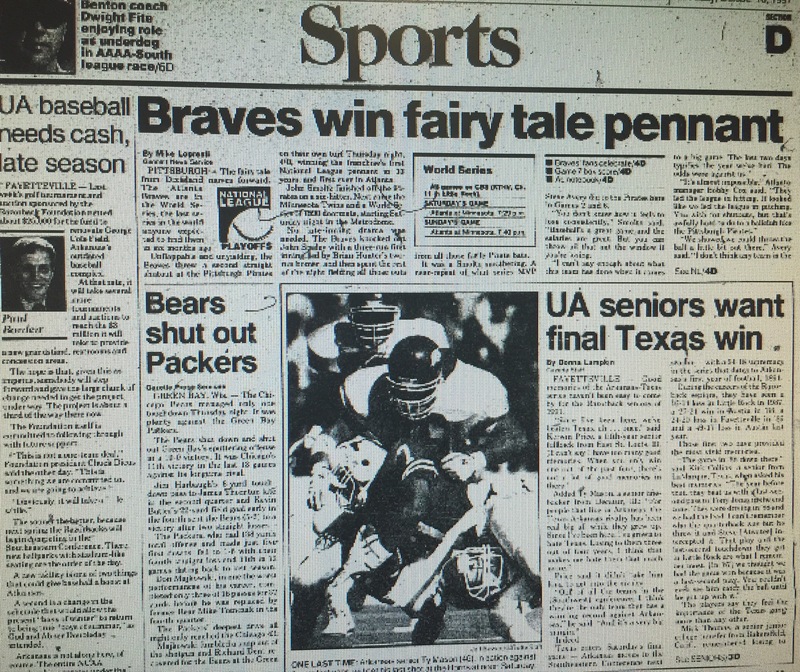 Max Brantley’s column on the front page of the B section also addressed the then-eminent end of the paper. However, as a newspaper all of the sections spent most of their space on the news of the day. 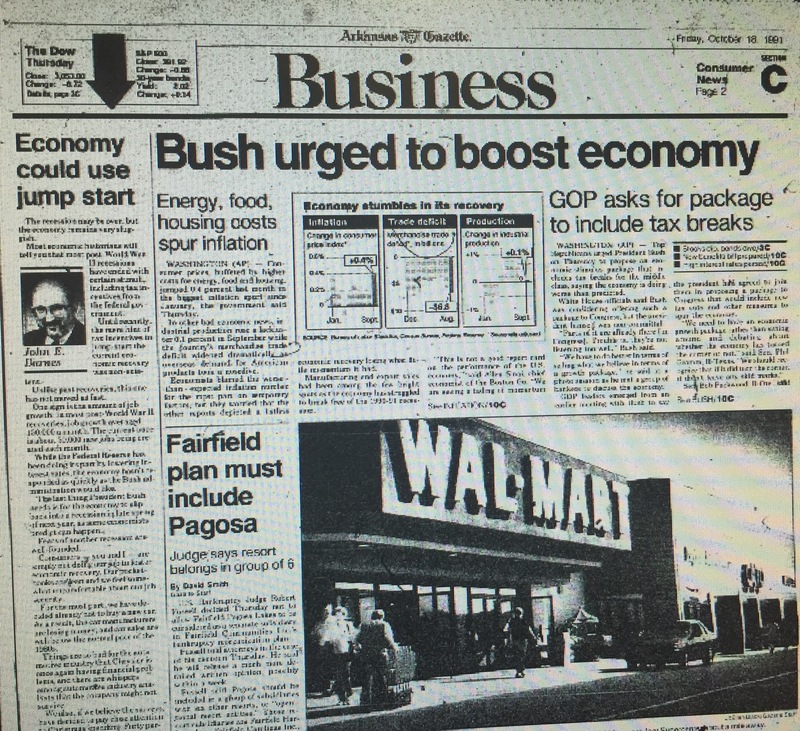 While Gazette staffers felt the end was likely near, few felt that the paper on October 18, 1991, would be the final edition. The back page of the last section of the Gazette featured an ad for Premiere Pontiac Nissan Audi which was throwing a “Beat Texas” party featuring Craig O’Neill. The Arkansas Razorbacks were scheduled to play the Texas Longhorns on Saturday, October 19. Here are the top halves of the front pages of sections B, C, D, and E for the final Arkansas Gazette. They tell the stories of trials, football games, corporate earnings, and cultural events. After months of planning, on December 29, 1821, the first edition of ARKANSAS GAZETTE to be published in Little Rock came off the press. Due to a shortage of paper supplies, it was only a two page edition, instead of the four pages which publisher William Woodruff had been customarily printing. Though the Gazette ceased publication in 1991, the 1821 publication of that paper in Little Rock set the stage for more than just that one newspaper. It marks a continual presence of newspaper and journal publication in Little Rock for 196 years. 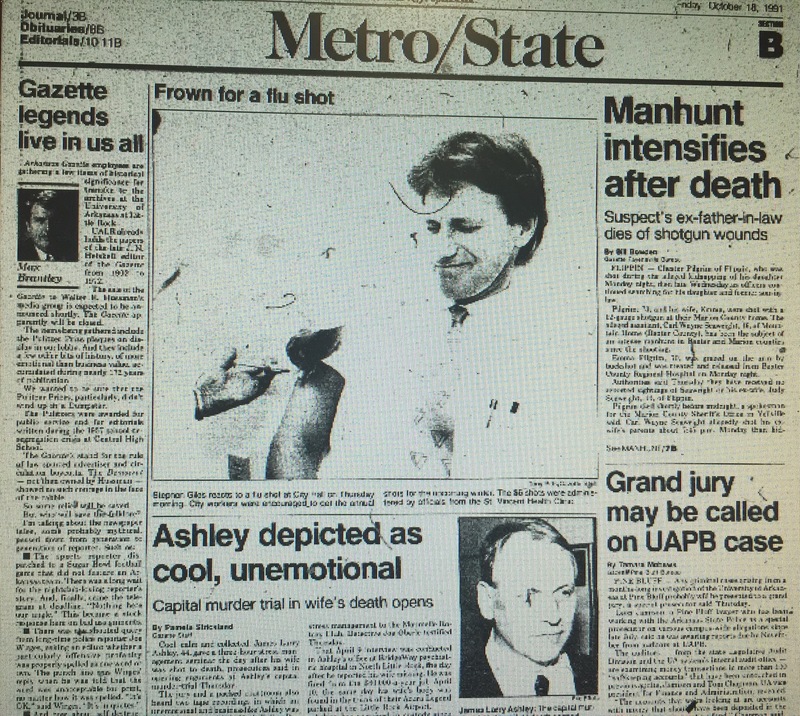 Twenty-five years ago today, on October 18, 1991, the final edition of the Arkansas Gazette was delivered. Here are the top halves of the front pages of sections B, C, D, and E for the final Atkansas Gazette. They tell the storie of trials, football games, corporate earnings, and cultural events.